The #1 way to make money online is to sell your own products. Every single top blogger in the world has their own product of some kind, whether it be physical or digital. For most bloggers, the jump into their own product is normally in the form of an eBook or other digital product that your readers can purchase and download instantly, and I highly recommend you look into this form of monetization if you have not already. However, there is one HUGE mistake that most bloggers make when looking to sell their own products online. #1 Blogger Mistake: Bloggers often rely on their blog to be the sales page for their products. If you are doing this right now, I already know what you are thinking. Why? Because I have been there. You don’t want the reader to leave your site or your content. 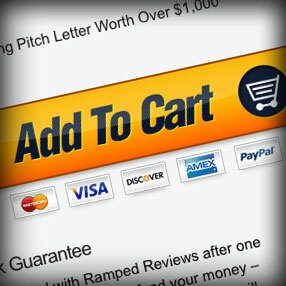 You don’t know how to design a sales page or at least how to do one easily and cheaply. You don’t have the time to set one up right now and the quickest way was to create a page on your blog. Where is the flaw in using a page on your blog as the sales page for your eBook? There are far too many distractions on your blog to keep high conversion rates on your products. Think about it…the same reasons you want to keep the sales page on your blog are the same reasons it will not sell well. When your potential customer lands on your page, they need to have only one thing in mind…”what is this product, how will it benefit me and am I going to buy it for that price.” If that same potential customer also sees a list of your recent articles, navigation or worse…ads like Adsense, you are inviting them to find something else to do other than buy your product. What is the difference between a sales page and squeeze page? At the end of the day…not much really. Each one is setup basically the same way, but they have a different end goal for the visitor of that page. So whether you are going for an opt-in to your newsletter or a sale of your product, sales and squeeze pages are going to convert at higher rates due to their design. Ideally, we would like to not have to hire a designer or operate outside of WordPress for our squeeze and sales pages, so when I went looking around for themes to accomplish this goal for me…I ran across OptimizePress. Not only did it promise to make my sales and squeeze page process much easier, but it also has some drip marketing, video and membership site features that I plan on using in the future. Squeeze Page Building System – Create high impact squeeze page designs from a range of 10 templates, all tested and proven to convert – so you get more people on your mailing list fast! Sales Letter & Offer Page Building System – Easily create sales letters, offer pages, bonus pages and more, with our unique point and click system. Now you can have pages that look like a pro-designer has created them, for a fraction of the price! Add video to your pages with one click – just paste in your video URL (from Amazon S3 or similar) or use video from Youtube, Vimeo, Viddler or any other video hosting site. Using video is proven to boost response and conversions! Unique iPad & iPhone Video compatibility – OptimizePress has been developed with a unique system to ensure your videos will also work on iPads and iPhones, which are fast becoming popular browsing platforms. Simply enter the URL of your video encoded in the correct format, and OptimizePress will do the rest! Shortcodes Sales Letter Elements – Easily add extra headlines, subheadlines, bullet blocks, content boxes, order boxes and more to your sales letters and offer pages with our point and click shortcodes – no more messy HTML and CSS! Cross Browser Compatible – All our designs are coded with the latest HTML and CSS standards, and have been tested on all the latest browsers (and some older ones too!). This means more people will be able to access your pages and see them as you desired! Basically, you install the theme and start the process of creating your page through the use of short codes. It also perfectly integrates with all of the major newsletter service providers (I use Aweber) if you are looking to create a squeeze page or easily capture the contact information of your customers. Just to show you how easy this theme is to use, I have put together this quick video that gives you a look at the backend in the page creation screen. Now…keep in mind…this is a very simplistic look as you can really expand on the features of OptimizePress to make it your own. What Have Been My Results? Over the past month, I have converted all of my sales and squeeze pages on Blogging Labs and Bike198 over to OptimizePress. Overall, my conversion rates have increased about 20% just by having better looking, easier to setup sales pages for my eBooks. I am going to start split testing different content to see how I can get my conversions even higher, but so far I am incredibly happy with the result and ease of setup with this theme. Everything you need, from graphics packages to all of the icons and buttons, are included with the theme and the settings are easy to understand. If you have installed a WordPress theme in the past…you should have zero problem getting this setup. At $97.00, it is on the high end of WordPress themes these days, but I do believe it is worth it as I have barely even scratched the surface of what it is capable of. Also, the increase in sales has more than offset the price of the theme which makes it worth it on its own. If you are looking for a high-quality, easy to setup option for your sales and squeeze pages, OptimizePress is an incredible option. Through my entire testing period, I only had one glitch and that was fixed with the latest update (the add to cart buttons were not working in Chrome…but that is fixed now) and the support has been incredible. Anyone can setup high converting pages with OptimizePress. Click here to see the rest of OptimizePress’s features or purchase. This is the most useful blog you could have possibly posted for where I am in my blogging journey. Thank you, thank you, thank you!! As your main site is running the PlatformPro theme from Pagelines, and you can only have one theme active with WordPress at any one time, i presume you had to install a second instance of WordPress to run your sales pages on the Optimizepress theme. How did that work for you? No issues? And what made you choose to install in subfolders rather than on a sub domain please. I am interested in how this was approached. Meantime – love the new Bloggin Labs main site theme. The other urls are actually subdomains with their own WordPress install. Thanks for the feedback on Blogging Labs! Great information! Thanks, its a big help for a starter like me. I am trying to learn as much as I can. I actually am using Optimise Press right now, what do you think about it? Need an experts opinion. thanks! Great info here, Robb. I’m down 100% with these ideas, strategies and tactics. This is great timing because just this evening I had a chance to work on an OptimizePress site and it does have just about anything you could want from landing or sales pages, including A/B split testing, which is very important. And really, the price is nothing compared to how much you’d make from selling just one ebook or product… even if you had a small audience. It’s a no-brainer investment in your own profitability. Hey Robb, Kevin Stacey here..
confused by the differences between the website homepage, sales pages and squeeze pages. Your post seems to break down these types of pages so well that I think it will really get website owners motivated to create quality sales pages with Optimize Press. Hopefully you will enjoy the post as well and keep up the spectacular writing!